What are glaucoma symptoms and signs? How do physicians diagnose glaucoma? How often should someone be screened for glaucoma? What medications (eyedrops) treat glaucoma? What types of surgery or laser therapy treat glaucoma? What is the prognosis of glaucoma? What is in the future for glaucoma? Glaucoma is an eye disease that is often associated with elevated intraocular pressure, in which damage to the eye (optic) nerve can lead to loss of vision and even blindness. Glaucoma usually causes no symptoms early in its course, at which time it can only be diagnosed by regular eye examinations (screenings with the frequency of examination based on age and the presence of other risk factors). Intraocular pressure increases when either too much fluid is produced in the eye or the drainage or outflow channels (trabecular meshwork) of the eye become blocked. While anyone can develop glaucoma, some people are at greater risk. The two main types of glaucoma are open-angle glaucoma, which has several variants and is a long duration (chronic) condition, and angle-closure glaucoma, which may be either a sudden (acute) condition or a chronic disease. Damage to the optic nerve and impairment of vision from glaucoma are irreversible. Several painless tests that determine the intraocular pressure, the status of the optic nerve and drainage angle, and visual fields are used to diagnose the presence of glaucoma and monitor its progression. Glaucoma is usually treated with eyedrops, although laser treatment and surgery can also be used. Most cases can be controlled well with these treatments, thereby preventing further loss of vision. Much research into the causes and treatment of glaucoma is being carried out throughout the world. Early diagnosis and treatment are key to preserving sight in people with glaucoma. Glaucoma is the term applied to a group of eye diseases that gradually result in loss of vision by permanently damaging the optic nerve, the nerve that transmits visual images to the brain. The leading cause of irreversible blindness, glaucoma often produces no symptoms until it is too late and vision loss has begun. Glaucoma is a disease of the major nerve of vision, called the optic nerve. The optic nerve receives light-generated nerve impulses from the retina and transmits these to the brain, where we recognize those electrical signals as vision. Glaucoma is characterized by a particular pattern of progressive damage to the optic nerve that generally begins with a subtle loss of side vision (peripheral vision). If glaucoma is not diagnosed and treated, it can progress to loss of central vision and blindness. Glaucoma is usually, but not always, associated with elevated pressure in the eye (intraocular pressure). Generally, it is this elevated eye pressure that leads to damage of the eye (optic) nerve. In some cases, glaucoma may occur in the presence of normal eye pressure. This form of glaucoma is believed to be caused by poor regulation of blood flow to the optic nerve. Worldwide, glaucoma is the second leading cause of irreversible blindness. In fact, as many as 6 million individuals are blind in both eyes from this disease. In the United States alone, according to one estimate, more than 3 million people have glaucoma. As many as half of these individuals with glaucoma may not know that they have the disease. The reason they are unaware of the presence of the disease is that glaucoma initially causes no symptoms, and the subsequent loss of side vision (peripheral vision) is usually not recognized. Elevated pressure in the eye is the main factor leading to glaucomatous damage to the eye (optic) nerve. Glaucoma with normal intraocular pressure is discussed below in the section on the different types of glaucoma. The optic nerve, which is located in back of the eye, is the main visual nerve for the eye. This nerve transmits the images we see back to the brain for interpretation. The eye is firm and round, like a basketball. Its tone and shape are maintained by a pressure within the eye (the intraocular pressure), which normally ranges between 8 millimeters (mm) and 22 mm of mercury. When the pressure is too low, the eye becomes softer, while an elevated pressure causes the eye to become harder. The optic nerve is the most susceptible part of the eye to high pressure because the delicate fibers in this nerve are easily damaged either by direct pressure on the nerve or decreased blood flow to the nerve. The front of the eye is filled with a clear fluid called the aqueous humor, which provides nourishment to the structures in the front of the eye. This fluid is produced constantly by the ciliary body, which surrounds the lens of the eye. 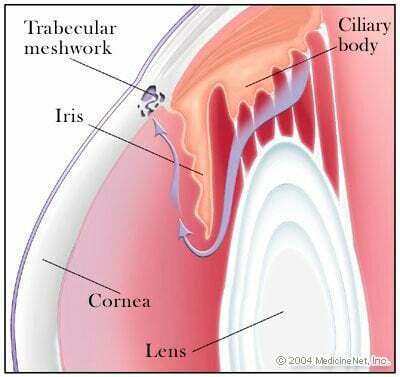 The aqueous humor then flows through the pupil and leaves the eye through tiny drainage channels called the trabecular meshwork. These channels are located at what is called the drainage angle of the eye. This angle is where the clear cornea, which covers the front of the eye, attaches to the base (root or periphery) of the iris, which is the colored part of the eye. The cornea covers the iris and the pupil, which are in front of the lens. The pupil is the small, round, black-appearing opening in the center of the iris. Light passes through the pupil, on through the lens, and to the retina at the back of the eye. Please see the figure, which is a diagram that shows the drainage angle of the eye. Legend for figure: This diagram of the front part of the eye is in cross section to show the filtering, or drainage, angle. This angle is between the cornea and the iris, which join each other right where the drainage channels (trabecular meshwork) are located. The arrow shows the flow of the aqueous fluid from the ciliary body, through the pupil, and into the drainage channels. This figure is recreated from Understanding and Treating Glaucoma, a book by Tim Peters and Company Inc., Gladstone N.J. In most people, the drainage angles are wide open, but in some individuals, they can be narrow. For example, the usual angle is about 45 degrees, whereas a narrow angle is about 25 degrees or less. After exiting through the trabecular meshwork in the drainage angle, the aqueous fluid then drains into tiny blood vessels (capillaries) into the main bloodstream. The aqueous humor should not be confused with tears, which are produced by the lacrimal glands under the upper eyelid outside of the eyeball itself. This process of producing and removing the fluid from the eye is similar to that of a sink with the faucet always turned on, producing and draining the water. If the sink's drain becomes clogged, the water may overflow. If this sink were a closed system, as is the eye, and unable to overflow, the pressure within the sink would rise. Likewise, if the eye's trabecular meshwork becomes clogged or blocked, the intraocular pressure may become elevated. Also, if the sink's faucet is on too high, the water may overflow. Again, if this sink were a closed system, the pressure within the sink would increase. Likewise, if too much fluid is being produced within the eye, the intraocular pressure may become too high. In either event, since the eye is a closed system, if it cannot adequately remove the increased fluid, the pressure builds up and optic-nerve damage may result. There are many different types of glaucoma. Most, however, can be classified as either open-angle glaucomas, which are usually conditions of long duration (chronic), or angle-closure (closed angle) glaucomas, which include conditions occurring both suddenly (acute) and over a long period of time (chronic). Primary glaucoma is not a result of other eye disease, while secondary glaucoma is a result of other eye conditions, trauma, or medication. The glaucomas usually affect both eyes, but the disease can progress more rapidly in one eye than in the other. Involvement of just one eye occurs only when the glaucoma is brought on by factors such as a prior injury, inflammation, or the use of steroids only in that eye. Primary open-angle glaucoma (POAG) is by far the most common type of glaucoma. Moreover, its frequency increases greatly with age and it is a chronic, not acute, disease. This increase occurs because the drainage mechanism gradually may become clogged secondary to aging, even though the drainage angle is open. As a consequence, the aqueous fluid does not drain from the eye properly. The pressure within the eye, therefore, builds up painlessly and without symptoms. Furthermore, as mentioned previously, since the resulting loss of vision starts on the side (peripherally), people are usually not aware of the problem until the loss encroaches near or into their central visual area. This type of glaucoma is said to be primary because its cause cannot be attributed to any discernable structural changes within the eye. Normal-tension (pressure) glaucoma or low tension glaucoma are variants of primary chronic open-angle glaucoma that are being recognized more frequently than in the past. This type of glaucoma is thought to be due to decreased blood flow to the optic nerve. This condition is characterized by progressive optic-nerve damage and loss of peripheral vision (visual field) despite intraocular pressures in the normal range or even below normal. This type of glaucoma can be diagnosed by repeated examinations by the eye doctor to detect the nerve damage or the visual field loss. Congenital glaucoma (infantile glaucoma) is a relatively rare, inherited type of open-angle glaucoma. In this condition, the drainage area is not properly developed before birth. This results in increased pressure in the eye that can lead to the loss of vision from optic-nerve damage and also to an enlarged eye. The eye of a young child enlarges in response to increased intraocular pressure because it is more pliable than the eye of an adult. Early diagnosis and treatment with medication and/or surgery are critical in these infants and children to preserve their sight. Secondary open-angle glaucoma is another type of open-angle glaucoma. It can result from an eye (ocular) injury, even one that occurred many years ago. Other causes of secondary glaucoma are inflammation in the iris of the eye (iritis), diabetes, cataracts, or in steroid- susceptible individuals, the use of topical (drops) or systemic (oral or injected) steroids (cortisone). It can also be associated with a retinal detachment or retinal vein occlusion or blockage. (The retina is the layer that lines the inside of the back of the eye.) The treatments for the secondary open-angle glaucomas vary, depending on the cause. Pigmentary glaucoma is a type of secondary glaucoma that is more common in younger men. In this condition, for reasons not yet understood, granules of pigment detach from the iris, which is the colored part of the eye. These granules then may block the trabecular meshwork, which, as noted above, is a key element in the drainage system of the eye. Finally, the blocked drainage system leads to elevated intraocular pressure, which results in damage to the optic nerve. Exfoliative glaucoma (pseudoexfoliation or PXE) is another type of glaucoma that can occur with either open or closed angles. This type of glaucoma is characterized by deposits of flaky material on the front surface of the lens (anterior capsule) and in the angle of the eye. The accumulation of this material in the angle is believed to block the drainage system of the eye and raise the eye pressure. While this type of glaucoma can occur in any population, it is more prevalent in older people and people of Scandinavian descent. It has recently been shown to often be associated with hearing loss in older people. Angle-closure glaucoma (closed-angle glaucoma) is a less common form of glaucoma in the Western world but is extremely common in Asia. 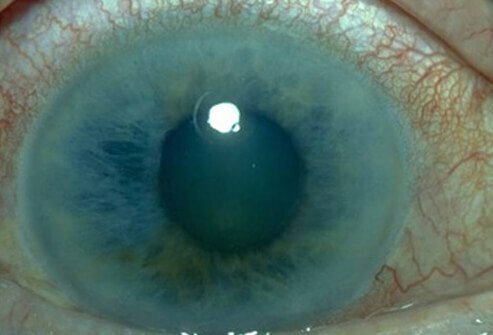 Angle-closure glaucoma may be acute or chronic. The common element in both is that a portion of or the entire drainage angle becomes anatomically closed, so that the aqueous fluid within the eye cannot reach all or part of the trabecular meshwork. In acute angle-closure glaucoma, the patient's intraocular pressure, which ordinarily is normal, can go up very suddenly (acutely). This sudden pressure increase occurs because the drainage angle becomes closed and blocks off all the drainage channels. This type of glaucoma can occur when the pupil dilates (widens or enlarges). As a result, the peripheral edge of the iris can become bunched up against its corneal attachment, thereby causing the drainage angle to close. Thus, the problem in angle-closure glaucoma is the difficulty with access of the eye fluid to the drainage system (trabecular meshwork). In contrast, remember that the problem in open-angle glaucoma is clogging within the drainage system itself. In chronic open-angle glaucoma, portions of the drainage angle remain closed over a long period of time and damage the drainage system. As more and more areas become closed, the pressure within the eye rises, often over a period of months or years. An attack of acute angle-closure glaucoma may be associated with severe eye pain and headache, a red (inflamed) eye, nausea, vomiting, and blurry vision. In addition, the high intraocular pressure leads to corneal swelling (edema), which causes the patient to see haloes around lights. Sometimes, acute glaucoma is treated with oral carbonic anhydrase inhibitors. (See the section below on these medications.) An attack of acute glaucoma, however, is usually relieved by eye surgery. In this operation, the doctor makes a small hole in the iris with a laser (laser iridotomy) to allow the fluid to resume draining into its normal outflow channels. Patients with open-angle glaucoma and chronic angle-closure glaucoma in general have no symptoms early in the course of the disease. Visual field loss (side vision loss) is not a symptom until late in the course of the disease. Rarely patients with fluctuating levels of intraocular pressure may have haziness of vision and see haloes around lights, especially in the morning. On the other hand, the symptoms of acute angle-closure are often extremely dramatic with the rapid onset of severe eye pain, headache, nausea and vomiting, and visual blurring. Occasionally, the nausea and vomiting exceed the ocular symptoms to the extent that an ocular cause is not considered when attempting to make a diagnosis. The eyes of patients with open-angle glaucoma or chronic angle-closure glaucoma may appear normal in the mirror or to family or friends. Some patients get slightly red eyes from the chronic use of eyedrops. The ophthalmologist, on examining the patient, may find elevated intraocular pressure, optic-nerve abnormalities, or visual field loss in addition to other less common signs. The eyes of patients with acute angle-closure glaucoma will appear red, and the pupil of the eye may be large and nonreactive to light. The cornea may appear cloudy to the naked eye. The ophthalmologist will typically find decreased visual acuity, corneal swelling, highly elevated intraocular pressure, and a closed drainage angle. Ophthalmologists diagnose and medically and surgically treat glaucoma. An ophthalmologist is a medical doctor who has undergone additional training to specialize in diseases and surgery of the eye. An eye doctor (ophthalmologist) can usually detect those individuals who are at risk for glaucoma (because of, for example, a narrow drainage angle or increased intraocular pressure) before nerve damage occurs. The doctor also can diagnose patients who already have glaucoma by observing their nerve damage or visual field loss. The following tests, all of which are painless, may be part of this evaluation. Tonometry determines the pressure in the eye by measuring the tone or firmness of its surface. Several types of tonometers are available for this test, the most common being the applanation tonometer. After the eye has been numbed with anesthetic eyedrops, the tonometer's sensor is placed against the front surface of the eye. The firmer the tone of the surface of the eye, the higher the pressure reading. Pachymetry measures the thickness of the cornea. After the eye has been numbed with anesthetic eyedrops, the pachymeter tip is touched lightly to the front surface of the eye (cornea). Studies have shown that corneal thickness can affect the measurement of intraocular pressure. Thicker corneas may give falsely high eye pressure readings and thinner corneas may give falsely low pressure readings. Furthermore, thin corneas may be an additional risk factor for glaucoma. Once a doctor knows the thickness of a patient's cornea, he or she can more accurately interpret the patient's tonometry. Gonioscopy is done by numbing the eye with anesthetic drops and placing a special type of contact lens with mirrors onto the surface of the eye. The mirrors enable the doctor to view the interior of the eye from different directions. The purpose of this test is to examine the drainage angle and drainage area of the eye. In this procedure, the doctor can determine whether the angle is open or narrow and find any other abnormalities, such as increased pigment in the angle or long-standing damage to the angle from prior inflammation or injury. As indicated earlier, individuals with narrow angles have an increased risk for a sudden closure of the angle, which can cause an acute angle-closure glaucomatous attack. Gonioscopy can also determine whether the eye is subject to chronic angle closure, whether blood vessels are abnormal, or whether hidden tumors might be blocking the drainage of the aqueous fluid out of the eye. Ophthalmoscopy is an examination in which the doctor uses a handheld device, a head-mounted device or a special lens and the slit lamp to look directly through the pupil (the opening in the colored iris) into the eye. This procedure is done to examine the optic nerve (seen as the optic disc) at the back of the eye. Damage to the optic nerve, called cupping of the disc, can be detected in this way. Cupping, which is an indentation of the optic disc, can be caused by increased intraocular pressure. Asymmetry in the degree of optic nerve cupping between the two eyes can be a sign of glaucoma, as can increase in optic nerve cupping over a period of time. Additionally, a pale color of the nerve can suggest damage to the nerve from poor blood flow or increased intraocular pressure. Special cameras can be used to take photographs of the optic nerve to compare changes over time. Visual field testing actually maps the visual fields to detect any early (or late) signs of glaucomatous damage to the optic nerve. In order to find and follow glaucoma, visual fields are measured by a computer one eye at a time. One eye is covered and the patient places his or her chin in a type of bowl. Lights of various intensity and size are randomly projected around inside of the bowl. When the patient sees a light, he or she pushes a button. This process produces a computerized map of the visual field, outlining the areas where each eye can or cannot see. In glaucoma, there are characteristic changes in the visual field examination. Confocal laser scanning systems and optical coherence tomography are noninvasive imaging systems that create a three-dimensional image of the optic nerve and retina to evaluate the degree of cupping and the thicknesses of the retinal nerve fiber layer and ganglion cell layers to better evaluate and quantify the presence of ocular damage from all types of glaucoma. Age 20 to 29: Individuals of African descent (African-Americans) or with a family history of glaucoma should have an eye examination every three to five years. Others should have an eye exam at least once during this period. Age 30 to 39: Individuals of African descent or with a family history of glaucoma should have an eye examination every two to four years. Others should have an eye exam at least twice during this period. Age 40 to 64: Individuals should have an eye examination every two to four years. Age 65 or older: Individuals should have an eye examination every one to two years. These routine screening eye examinations are mandatory since glaucoma usually causes no symptoms (asymptomatic) in its early stages. Once damage to the optic nerve has occurred, it cannot be reversed. Thus, in order to preserve vision, glaucoma must be diagnosed early and followed regularly. Patients with glaucoma need to be aware that it is a lifelong disease. Compliance with scheduled visits to the eye doctor and with prescribed medication regimens offers the best chance for maintaining vision. Although nerve damage and visual loss from glaucoma cannot usually be reversed, glaucoma is a disease that can generally be controlled. That is, treatment can make the intraocular pressure normal and, therefore, prevent or retard further nerve damage and visual loss. Treatment may involve the use of eyedrop medications, pills (rarely), laser, or incisional surgery. In the United States, eyedrop medications are usually used first in treating most types of open-angle glaucoma. In contrast, in Europe, laser or surgery is sometimes the first choice of treatment. One or more types of eyedrops may have to be taken up to several times a day to lower intraocular pressure. These drops work either by reducing the production of the aqueous fluid (shutting the faucet) or by increasing the drainage of the fluid out of the eye. Each type of therapy has its benefits and potential complications. It is important to remember that many patients at risk for glaucoma or who have glaucoma also may have other eye diseases such as cataract or macular degeneration. An ophthalmologist can determine whether any visual loss that one is experiencing is being caused by glaucoma or by other eye abnormalities. There are many patients whose examination reveals elevated eye pressure and increased risk for glaucoma but no definite evidence of eye damage from glaucoma. These patients have what is termed ocular hypertension (OHT), formerly known as "pre-glaucoma" or "glaucoma suspect." Patients with OHT have no visual field loss but are at increased risk of glaucoma because of the presence of elevated intraocular pressure or optic nerve changes visible on ophthalmoscopy or imaging. Some of the patients with OHT require treatment. These patients with OHT need to be observed frequently so that treatment can be initiated prior to the onset of glaucomatous damage. Beta-adrenergic antagonists act against, or block, adrenaline-like substances. These drops work in the treatment of glaucoma by reducing the production of the aqueous humor. For years, they were the gold standard (to which other agents are compared) for treating glaucoma. A few of these medications are timolol (Timoptic), levobunolol (Betagan), carteolol (Ocupress), and metipranolol (Optipranolol). Used once or twice daily, these drops are very effective. However, side effects, such as the worsening of asthma or emphysema, bradycardia (slow heart rate), low blood pressure, fatigue, and impotence prohibit their use in some patients. Betaxolol (Betoptic) is a beta-adrenergic antagonist that is more selective in working just on the eye and, therefore, carries less risk of heart (cardiac) or lung (pulmonary) side effects than other drops of this type. Prostaglandin analogs are similar in chemical structure to the body's prostaglandins. Prostaglandins are hormone-like substances that are involved in a wide range of functions throughout the body. These drops work in glaucoma by increasing the outflow (drainage) of fluid from the eye. The prostaglandin analogs have replaced beta-blockers as the most commonly prescribed drops for glaucoma. They can be used just once a day. This class of medications has fewer systemic (involving the rest of the body) side effects than beta blockers, but can change the color of the iris as well as thicken and darken the eyelashes. In addition, some atrophy of the fat around the eye may occur. These drops are also more likely to cause redness of the eyes than some other classes of eye drops. In some patients, they may also cause inflammation inside the eye. Examples of these medications include latanoprost (Xalatan), travoprost (Travatan), bimatoprost (Lumigan), and tafluprost (Zioptan). Adrenergic agonists are a type of drops that act like adrenaline. They work in glaucoma by both reducing the production of fluid by the eye and increasing its outflow (drainage). The most popular adrenergic agonist is brimonidine (Alphagan). However, there is at least a 12% risk of significant local (eye) allergic reactions. Other members of this class of drops include epinephrine, dipivefrin (Propine), and apraclonidine (Iopidine). Carbonic anhydrase inhibitors work in glaucoma by reducing the production of fluid in the eye. Eyedrop forms of this type of medication include dorzolamide (Trusopt) and brinzolamide (Azopt). They are used two or three times daily. Carbonic anhydrase inhibitors may also be rarely taken as pills (systemically) to remove fluid from the body, including the eye. Oral forms of these medications used for glaucoma include acetazolamide (Diamox) and methazolamide (Neptazane). Their use in this condition, however, is limited due to their systemic (throughout the body) side effects, including reduction of body potassium, kidney stones, numbness or tingling sensations in the lips, arms, and legs, fatigue, and nausea. Parasympathomimetic agents, which are also called miotics because they narrow (constrict) the pupils, act by opposing adrenalin-like substances. They work in glaucoma by increasing the aqueous outflow from the eye. Osmotic agents are an additional class of medications used to treat sudden (acute) forms of glaucoma where the eye pressure remains extremely high despite other treatments. These medications include isosorbide (Ismotic, given by mouth) and mannitol (Osmitrol), given through the veins. These medications must be used cautiously as they have significant side effects, including nausea, fluid accumulation in the heart and/or lungs (congestive heart failure and/or pulmonary edema), bleeding in the brain, and kidney problems. Their use is prohibited in patients with uncontrolled diabetes, heart, kidney, or liver problems. Ophthalmologists often prescribe an eyedrop containing more than one class of drug to patients who require more than one type of drug for control of their glaucoma. This simplifies the taking of drops by the patient. Examples of these include the combination of timolol and dorzolamide in the same drop (Cosopt), the combination of timolol and brimonidine in the same drop (Combigan), and the combination of brinzolamide and brimonidine in the same drop (Simbrinza). Combination drops that include both beta-adrenergic antagonists and prostaglandin analogs are available in Europe and Japan but have not been approved by the United States Food and Drug Administration (FDA) for use in the U.S.
Several new classes of glaucoma drops have recently been approved by the FDA and will soon be available for use in patients with glaucoma. These include a nitrous oxide donating medication combined with a prostaglandin (Latanoprostene and a rho-kinase [Rhopressa]). Although marijuana use has been shown to reduce intraocular pressure, eyedrops are available that accomplish the same purpose and with greater efficacy and less systemic risk. There are several forms of laser therapy for glaucoma. Laser iridotomy (see the section above on angle-closure glaucoma) involves making a hole in the colored part of the eye (iris) to allow fluid to drain normally in eyes with narrow or closed angles. Argon laser trabeculoplasty and selective laser trabeculoplasty (SLT) are laser procedures performed only in eyes with open angles. Laser trabeculoplasty does not cure glaucoma, but may be done instead of increasing the number of different eyedrops, or may be recommended when a patient is already using multiple eyedrops (maximal medical therapy). In some cases, it is used as the initial or primary therapy for open-angle glaucoma. This procedure is a quick, relatively painless, and safe method of lowering the intraocular pressure. With the eye numbed by anesthetic drops, the laser treatment is applied through a mirrored contact lens to the angle of the eye. Microscopic laser burns to the angle allow fluid to better exit the drainage channels. Laser trabeculoplasty is often done in two sessions, weeks or months apart. Unfortunately, the improved drainage as a result of the treatment may last only about two years, by which time the drainage channels tend to clog again. There are different types of laser trabeculoplasty including argon laser trabeculoplasty (ALT) and selective laser trabeculoplasty (SLT). ALT is generally not repeated after the second session due to the formation of scar tissue in the angle. SLT is less likely to produce scarring in the angle, so, theoretically, it can be repeated multiple times. However, the likelihood of success with additional treatments when prior attempts have failed is low. Thus, the options for the patient at that time are to increase the use of eyedrops or proceed to surgery. Laser cyclo-ablation (also known as ciliary body destruction or cyclophotocoagulation) is another form of laser treatment generally reserved for patients with severe forms of glaucoma with poor visual potential. This procedure involves applying laser burns to the part of the eye that makes the aqueous fluid (ciliary body). This therapy destroys the cells that make the fluid, thereby reducing the eye pressure. This type of laser is typically performed after other more traditional therapies have failed. Cyclocryopexy is the use of freezing, rather than laser, to achieve a similar purpose of reducing aqueous production. Trabeculectomy is a delicate microsurgical procedure used to treat glaucoma. In this operation, a small piece of the clogged trabecular meshwork is removed to create an opening and a new drainage pathway is made for the fluid to exit the eye. As part of this new drainage system, a tiny collecting bag is created from conjunctival tissue. (The conjunctiva is the clear covering over the white of the eye.) This bag is called a "filtering bleb" and looks like a cystic raised area that is at the top part of the eye under the upper lid. The new drainage system allows fluid to leave the eye, enter the bag/bleb, and then pass into the capillary blood circulation (thereby lowering the eye pressure). Trabeculectomy is the most commonly performed glaucoma surgery. If successful, it is the most effective means of lowering the eye pressure. Aqueous shunt devices (glaucoma implants or tubes) are artificial drainage devices used to lower the eye pressure. They are essentially plastic microscopic tubes attached to a plastic reservoir. The reservoir (or plate) is placed beneath the conjunctival tissue. The actual tube (which extends from the reservoir) is placed inside the eye to create a new pathway for fluid to exit the eye. This fluid collects within the reservoir beneath the conjunctiva creating a filtering bleb. This procedure may be performed as an alternative to trabeculectomy in patients with certain types of glaucoma. Shunts used today are either valved (Ahmed type) or non-valved (Baerveldt type). Mini shunts without a reservoir are also used to improve safety and reduce the post-surgery chance of pressures that are too low. In the past few years, minimally-invasive glaucoma surgery (MIGS) has been under development and is more frequently used as a surgical procedure. Various devices such as the Trabectome, the IStent, the CyPass Micro-Stent, the Xen glaucoma implant, the Hydrus Microstent, the InnFocus Microshunt, viscocanaloplasty, and gonioscopy-assisted transluminal trabeculotomy (GATT) have been either approved for human use or are in advanced clinical trials. These provide alternative surgical procedures used to lower eye pressure. These procedures are directed at creating openings in the trabecular meshwork, the drainage ring in the wall of the angle of the eye. These surgeries are less invasive than trabeculectomy and aqueous shunt surgery, have less potential for side effects or complications but may not lower pressure as much. The surgeon sometimes creates other types of drainage systems. While glaucoma surgery is often effective, complications, such as infection or bleeding, are possible. Accordingly, surgery is usually reserved for cases that cannot otherwise be controlled. The prognosis for glaucoma depends on when the disease is detected. If the diagnosis is made before significant optic nerve damage occurs, the prognosis is generally good if the patient is compliant with the treatment suggested by the ophthalmologist. Since optic nerve damage is permanent and previously damaged optic nerves are more prone to additional damage, a delayed diagnosis (one made after significant optic nerve damage and field loss has already occurred) requires more aggressive therapy and carries a prognosis for future visual loss, which is guarded over the long term. Primary open-angle glaucoma cannot be prevented, given our current state of knowledge. However, the optic-nerve damage and visual loss resulting from glaucoma can be prevented by earlier diagnosis, effective treatment, and compliance with treatment. Secondary types of glaucoma can often be prevented by avoidance of trauma to the eye and prompt treatment of eye inflammation and other diseases of the eye or body that may cause secondary forms of glaucoma. Most cases of visual loss from angle-closure glaucomas can be prevented by the appropriate use of laser iridotomy in eyes at risk for the development of acute or chronic angle-closure glaucoma. New eyedrops will continue to become available for the treatment of glaucoma. Some drops will be new classes of agents. Other drops will combine some already existing agents into one bottle to achieve an additive effect and to make it easier and more economical for patients to take their medication. Research is being done at the National Eye Institute and at most medical-school-affiliated institutions. Although lowering intraocular pressure is still the primary method of treating glaucoma, experts see the disease as more of a neurological condition than an eye disorder. Researchers are investigating the therapeutic role of neuroprotection of the optic nerve, especially in patients who seem to be having progressive nerve damage and visual field loss despite relatively normal intraocular pressures. Animal models have shown that certain chemical mediators can reduce injury or death of nerve cells. Proving such a benefit for the human optic nerve, however, is more difficult because, for one thing, biopsy or tissue specimens are not readily available. Nevertheless, if any of these mediators in eyedrops can be shown to protect the human optic nerve from glaucomatous damage, this would be a wonderful advance in preventing blindness. In other studies, new surgical methods are being evaluated to lower the intraocular pressure more safely without significant risk of damage to the eye or loss of vision. Finally, increased efforts to enhance public awareness of glaucoma, national free screenings for those individuals at risk, earlier diagnosis and treatment and better compliance with treatment are our best hopes to reduce vision loss from glaucoma. The AGIS Investigators. "The Advanced Glaucoma Intervention Study (AGIS): Comparison of treatment outcomes within race: 10-year results." Ophthalmology 111.4 (2004): 651-664. Epstein, D. L., et al. "A long-term clinical trial of timolol therapy versus no treatment in the management of glaucoma suspects." Ophthalmology 96.10 (1989): 1460-1467. Gedde, S. J., et al. "Treatment outcomes in the Tube Versus Trabeculectomy (TVT) Study after five years of follow-up." American Journal Ophthalmology 153.5 (2012): 789-803.e2. Gordon, M. O., et al. "The Ocular Hypertension Treatment Study: Baseline factors that predict the onset of primary open-angle glaucoma." Archives of Ophthalmology 120.6 (2002): 714-720. Heijl A, et al. "Reduction of intraocular pressure and glaucoma progression: results from the Early Manifest Glaucoma Trial." Archives of Ophthalmology 120.10 (2002): 1268-1279. Kass, M. A., et al. "The Ocular Hypertension Treatment Study: A randomized trial determines that topical ocular hypotensive medication delays or prevents the onset of primary open-angle glaucoma." Archives of Ophthalmology 120.6 (2002): 701-713. Katz, L. J., et al. "Selective laser trabeculoplasty versus medical therapy as initial treatment of glaucoma: a prospective, randomized trial." Journal of Glaucoma 21.7 (2012):460-468. Krupin, T., et al. "Low-Pressure Glaucoma Study Group. A randomized trial of brimonidine versus timolol in preserving visual function: results from the Low-Pressure Glaucoma Treatment Study." American Journal of Ophthalmology 151.4 (2011) 671-681. Lichter, P.R., et al. "CIGTS Study Group. Interim clinical outcomes in the Collaborative Initial Glaucoma Treatment Study comparing initial treatment randomized to medications or surgery." Ophthalmology 108.11 (2001): 1943-1953. Musch, D. C., et al. "CIGTS Study Group. Intraocular pressure control and long-term visual field loss in the Collaborative Initial Glaucoma Treatment Study." Ophthalmology 118.9 (2011): 1766-1773. Wishart, P. K. "Interpretation of the glaucoma 'landmark studies.'" British Journal of Ophthalmology 293.5 (2009): 561-562. Take this quiz to learn about common eye problems, diseases, and conditions like conjunctivitis (pinkeye), stye, myopia, presbyopia, glaucoma, lazy eye (amblyopia), and others. What kinds of treatments have been effective for your glaucoma? Did you or a relative have any of the risk factors for glaucoma when diagnosed? If so, what were they? Describe the signs and symptoms associated with glaucoma in you, a friend, or relative. What tests or exams led to a diagnosis of glaucoma? Please share your experience with surgery for glaucoma. Was this for you or a relative? Glaucoma (the sneak thief of sight) refers to certain eye diseases that affect the optic nerve and cause vision loss. 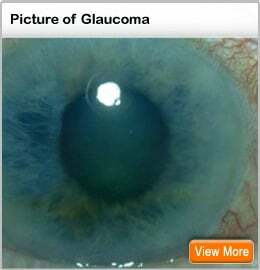 See a picture of Glaucoma and learn more about the health topic. and eliminate or reduce the need for contact lenses or glasses. Though there is no cure for Marfan syndrome, there are treatments that can minimize and sometimes prevent some complications. Medical marijuana (medical cannabis) is a medicine that is plant based. There are two species of medical marijuana; 1) Cannabis sativa, and 2) Cannabis indica. Medical marijuana is used to treat pain, nausea, anxiety, MS, insomnia, seizures, and muscle spasms. Medical cannabis is legal in a variety of states in the US. A card or licence is required to purchase medical marijuana in states where it is legal; however, medical cannabis is against Federal law. Medical marijuana comes in a variety of products, for example, gummy bears and other candy, muffins, cookies, drinks, salves, ointments, creams, oils, and wax. Getting the right screening test at the right time is one of the most important things a man can do for his health. Learn at what age men should be screened for prostate cancer, high blood pressure, cholesterol and other health risks. Sarcoidosis, a disease resulting from chronic inflammation, causes small lumps (granulomas) to develop in a great range of body tissues and can appear in almost any body organ. However, sarcoidosis most often starts in the lungs or lymph nodes. Scleritis is inflammation of the white part of the eye. It may be caused by a serious underlying condition, such as an autoimmune disease. Symptoms include redness, pain, tearing, sensitivity to light, and decreased visual acuity. Treatment may include eye drops as well as treatment for any underlying disease process. Scleritis cannot be prevented. Tonometry is a method for measuring the pressure in the eye (intraocular pressure or IOP), which is useful in detecting glaucoma. IOP can be determined with the help of a tonometer, a device which lightly touches the surface of the (anesthetized) eye and measures the eye's resistance to indentation.